Huawei thinks it knows what millennials want. That's why China's top smartphone maker believes the Honor 8 -- its second Honor-branded smartphone and first Honor "flagship" in the U.S. -- will be a hit. George Zhao, Honor's president, unveiled the new device at an event in San Francisco Tuesday night. While in New York last week, Zhao explained that the company was especially focused on building a phone that caters to millennials' mobile phone habits, from the way they watch sports and movies and listen to music, to share photos with friends. "We also consider culture and fashion trends," Zhao said. Much of that thought is reflected in the final product by way of the sleek design, new collection of camera features, enhanced battery life and price. But Huawei faces tough competition in the U.S., specifically from Samsung's Galaxy S7, which the Honor 8 most closely resembles. The phone also lacks a carrier partner and the brand is still a relatively unknown. Globally, however, Huawei is the third largest phone manufacturer behind Samsung and Apple (AAPL), which are first and second, respectively. The Honor 8 is an undeniably eye-catching phone, especially in the "Sapphire Blue" color. It also comes in white and black. The back camera is also fully covered by the glass, which makes it feel smooth and look beautiful. If you crack the glass or the screen, Huawei will repair it for free once during the first three months after purchase. 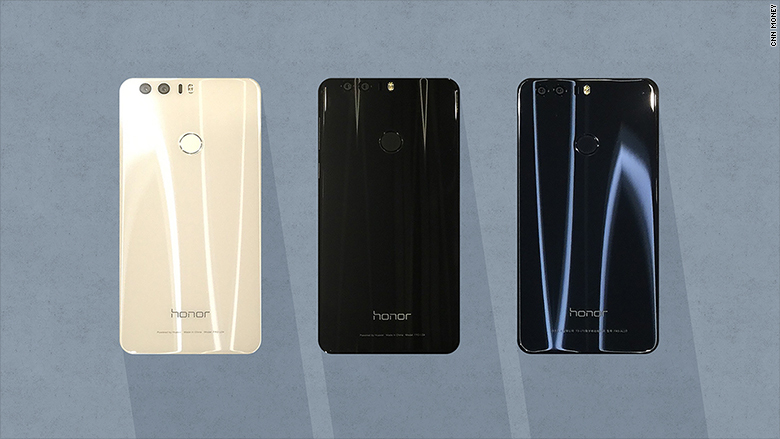 The Honor 8 comes in three colors - white, black, and "Sapphire Blue." 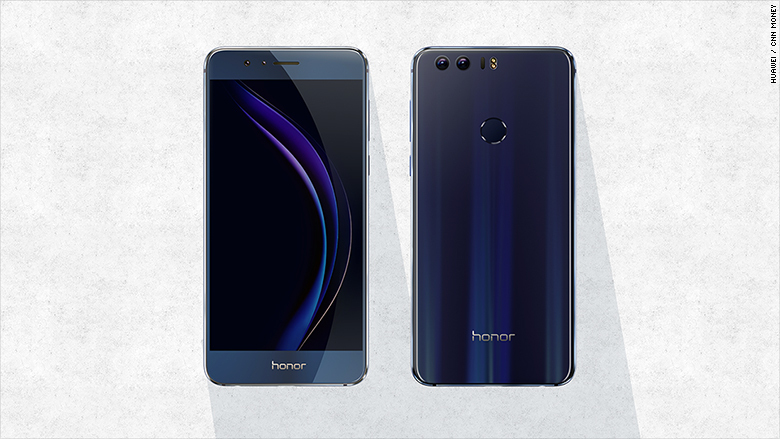 With a 5.2-inch display, the Honor 8 is slightly bigger in physical size than the Samsung Galaxy S7 (5.1 inches) and noticeably smaller than the Apple iPhone 6S Plus (5.5 inches). It weighs about the same as the Galaxy S7 at 5.4 ounces (153 grams), so it's a solid option for someone who wants a slightly larger screen without the bulk. But the best part about the phone's camera might be its quick capture feature: it's possible to launch the camera app and take a photo using just the volume button or fingerprint sensor, even if the phone is locked. The feature was designed to help its users quickly share photos on social media, according to Michelle Xiong, a VP at Huawei. Samsung has a similar shortcut when clicking twice on the home button, but it only launches the camera and doesn't take a picture. One of the best camera features available on the Chinese model is its 360-degree picture mode, but unfortunately it doesn't come on the U.S. version. Late last year, Huawei demonstrated a way to speed up battery charging by reaching about 48% capacity in just five minutes at an industry trade show. Powering up isn't quite that fast on the Honor 8, which has a 3000 mAh size battery, but Huawei claims it only takes half an hour to get to 50%. When CNNMoney put a test device to charge, it took that amount of time to take it from 63% to 94%. Like the Galaxy S7, the Honor 8 lets users expand the phone's internal storage from 32 GB or 64 GB up to 128 GB. Samsung allows for double that expansion size to 256 GB. The Honor 8 runs Android Marshmallow with Huawei Emotion UI, the company's customized version of the Android base operating system. Pre-sales for an unlocked Honor 8 begin on Wednesday at Amazon, Best Buy, B&H, Newegg and Honor's own e-commerce store. You won't, however, be able to purchase one through a carrier. The phone will only work on GSM networks, which means AT&T (T) and T-Mobile (TMUS) services are the only options in the U.S. Overall, for those looking for a less expensive phone that can perform as well as premium options at a lower price point, the Honor 8 is worth your attention.